What Is Entryway & Foyer Lighting? The varied options of pendant lighting and grand chandeliers that comprise the entry and foyer ceiling lights collection have typically vertically oriented proportions to complement those of a tall but narrow entryway. When combined with a pair of sconces on the wall, you'll guarantee ample illumination in a space that is typically meant for greetings and salutations. And if you have console tables or accent tables readily available in your entryway, you will love the splash of character a well-designed console lamp provides. This assortment of foyer lighting spans a variety of decorating styles, ranging from contemporary and modern entryway and foyer lights to fixtures fitting a home that is more transitional in its design. Lighting from Moooi can help you make a statement with large modern fixtures like the Random Light or the Heracluem Suspension, both by renown designer Bertjan Pot. In homes boasting with Scandinavian decor, look to a pendant by Denmark's Le Klint and if it is a wood look you love, turn to a veneer ceiling light by LZF. Transitional and traditionally styled entries benefit from the ceiling and wall light fixtures by George Kovacs and make a distinctly elegant statement with a luxury piece from Schonbek Lighting. Finally, to achieve energy efficiency in your space, you will want to check out the assortment of LED entryway lighting in the form of ceiling lights and wall lights. From suspensions to sconces, entryway lights can accommodate a range of sizes and shapes to best fit your needs. When shopping for your entryway and foyer lights, be sure to review the fixtures' dimensions including height, width, weight and cable suspension length (for hanging lights). You will also want to properly measure your entry and where you plan to install the light fixture to try to avoid any complications.You can then refine your oprtions by colors, finishes and shapes to choose the best lighting for the space. If you have any questions about the entry and foyer lighting featured here, please call our lighting experts at 877.445.4486. Most of the chandeliers and pendant lighting you will find in this selection can be applied to other rooms and areas of the home too. The same light fixtures you would use in foyers - and the dramatic focal points they provide - are suitable for any area with similar proportions within a home or office, such as in a stairwell or a dining room with high ceilings. You'll also want to check out the assortment of entryway furnishings to successfully complement your lighting choices. The assortment of furnishings includes tables, benches, rugs, mirrors, coat racks and umbrella stands that provide an elegant touch to the space. 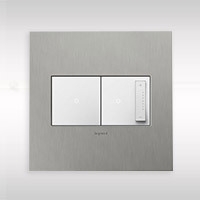 Finally, set the mood of your entryway by putting your lighting on a dimmer switch.